The book of Revelation speaks of seven seals on a prophetic scroll being opened before the return of Jesus Christ to earth. What are the meanings of these seals? 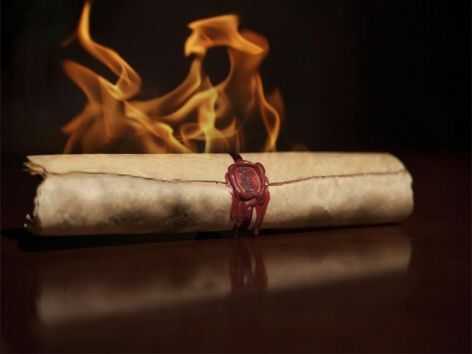 Revelation portrays a scroll with seven seals to be opened before Christ's second coming. The fifth chapter of the book of Revelation shows a scroll being presented to Jesus Christ in heaven. This scroll is closed by seven seals that are opened one by one to indicate things that will occur before and during Christ’s second coming. This section of Scripture pictures Jesus being honored as the One worthy to open these seals. While this event clearly occurs prior to the opening of the seals, other events in this chapter seem to be more of an overview of events, including things that will happen later. For example, Revelation 5:9-10 speaks of redeemed humans, who will be kings and priests on earth; and verse 13 speaks of “every creature which is in heaven and on the earth and under the earth and such as are in the sea” praising God the Father and the Lamb (another name for Jesus Christ). Instead of indicating a rapture of the saints prior to the opening of the seals, these verses show what will happen after the seals have been opened and the plan of God fulfilled. After giving this overview, chapter 6 and successive chapters explain with greater detail how this will occur—how there will eventually be only righteous people remaining, people who will certainly praise God. Reflecting the end result of God’s plan, we note that when the “new heaven” and “new earth” are presented (Revelation 21:1), only faithful overcomers will remain. “He who overcomes shall inherit all things, and I will be his God and he shall be My son. But the cowardly, unbelieving, abominable, murderers, sexually immoral, sorcerers, idolaters, and all liars shall have their part in the lake which burns with fire and brimstone, which is the second death” (verses 7-8). Because the first four of the seals and their meaning for earth’s inhabitants are presented metaphorically as messengers riding different-colored horses, they are commonly referred to as the four horsemen of the Apocalypse. The word apocalypse comes from the Greek word apokalupsis, meaning “disclosure” or “revelation.” So the phrase “the four horsemen of the Apocalypse” means the four horsemen of the book of Revelation. Since the meanings of the first four seals are the basis of the article “What Are the Four Horsemen of the Apocalypse?” we will just briefly cover these first four seals before focusing more extensively on the latter three. As the first seal was opened, the apostle John wrote: “And I looked, and behold, a white horse. He who sat on it had a bow; and a crown was given to him, and he went out conquering and to conquer” (Revelation 6:2). Comparing the seals to the events Christ said would happen in His famous Olivet Prophecy, this seal represents religious deception (see Matthew 24:5). When the second seal opened, John noted: “Another horse, fiery red, went out. And it was granted to the one who sat on it to take peace from the earth, and that people should kill one another; and there was given to him a great sword” (Revelation 6:4). This parallels Christ’s explanation that people would “hear of wars and rumors of wars” and that “nation will rise against nation” (Matthew 24:6-7). As for the third seal, John said, “So I looked, and behold, a black horse, and he who sat on it had a pair of scales in his hand. And I heard a voice in the midst of the four living creatures saying, ‘A quart of wheat for a denarius, and three quarts of barley for a denarius; and do not harm the oil and the wine’” (Revelation 6:5-6). This was a graphic depiction of Christ’s teaching that “there will be famines” prior to His return (Matthew 24:7). Describing the fourth horse, John penned: “So I looked, and behold, a pale horse. And the name of him who sat on it was Death, and Hades followed with him. And power was given to them over a fourth of the earth, to kill with sword, with hunger, with death, and by the beasts of the earth” (Revelation 6:8). This description pictures the “pestilences” or disease epidemics Jesus said would come to earth’s inhabitants prior to His return (Matthew 24:7). The events pictured by the first four seals—religious deception, war, famine and pestilences—have already been occurring. Listed as signs of Christ’s second coming and “the beginning of sorrows” (Matthew 24:8), these frightening events will intensify at the time of the end. “When He opened the fifth seal, I saw under the altar the souls of those who had been slain for the word of God and for the testimony which they held. And they cried with a loud voice, saying, ‘How long, O Lord, holy and true, until You judge and avenge our blood on those who dwell on the earth?’ Then a white robe was given to each of them; and it was said to them that they should rest a little while longer, until both the number of their fellow servants and their brethren, who would be killed as they were, was completed” (Revelation 6:9-11). Before focusing on the meaning of this seal, let’s consider the context of this vision. Because John is seeing faithful martyrs down through the ages and asking God how long it will be before their wrongful deaths are avenged, some have mistakenly assumed that this means these saints are alive in heaven waiting for God to judge those who killed them. We have to remember that this is a vision—not necessarily reality—to illustrate what is going to happen. Sometimes the Bible uses metaphors to symbolize events past, present or future. These metaphors are not to be understood literally. A familiar use of a metaphor is found in the book of Genesis where after Cain killed his brother, Abel, God said to Cain, “The voice of your brother’s blood cries out to me from the ground” (Genesis 4:10). The blood was figuratively crying out. The vision of the fifth seal, in which faithful martyrs through the ages are waiting for God to judge the world, symbolizes God’s purpose for this present earth and humanity, which is to bring “many sons to glory” (Hebrews 2:10). Paul metaphorically described this process saying, “For we know that the whole creation groans and labors with birth pangs together until now” (Romans 8:22). We need to remember that the purpose of the book of Revelation and its seals is to show what will happen in the future and that God’s plan of salvation will be fulfilled. The vision John was seeing to represent the fifth seal was that of the Great Tribulation that will be directed against the physical descendants of Jacob and God’s faithful people before Christ returns. Describing this time, Jesus said, “Then they will deliver you up to tribulation and kill you, and you will be hated by all nations for My name’s sake. And then many will be offended, will betray one another, and will hate one another” (Matthew 24:9-10, emphasis added throughout). Continuing to describe this time of unprecedented trial, Jesus said, “For then shall be great tribulation, such as has not been since the beginning of the world until this time, no, nor ever shall be. And unless those days were shortened, no flesh would be saved [alive]; but for the elect’s sake those days will be shortened” (verses 21-22). Describing what he saw when this seal opened, John wrote: “And behold, there was a great earthquake; and the sun became black as sackcloth of hair, and the moon became like blood. And the stars of heaven fell to the earth, as a fig tree drops its late figs when it is shaken by a mighty wind. Then the sky receded as a scroll when it is rolled up, and every mountain and island was moved out of its place” (Revelation 6:12-14). These supernatural events had long before been foretold as signs of the day of the Lord, the time of Christ’s return to earth. The prophet Joel had described this as “a day of darkness and gloominess, a day of clouds and thick darkness” and a time when “the sun and moon will grow dark, and the stars will diminish their brightness. … The heavens and earth will shake” (Joel 2:2; Joel 3:15-16). As these awesome events transpire, mankind will realize that God will soon bring punishment upon earth’s inhabitants because of disobedience to His laws. “And the kings of the earth, the great men, the rich men, the commanders, the mighty men, every slave and every free man, hid themselves in the caves and in the rocks of the mountains, and said to the mountains and rocks, ‘Fall on us and hide us from the face of Him who sits on the throne and from the wrath of the Lamb! For the great day of His wrath has come, and who is able to stand?’” (Revelation 6:15-17). The seventh seal, which includes seven trumpets, begins in Revelation 8. This seal, which is also called the Day of the Lord, is the predominant theme of the book of Revelation. It represents both “the wrath of the Lamb” (Revelation 6:16), which Christ will bring upon mankind because of disobedience to God’s laws, and the mercy of God, which will eventually come through the return of Jesus Christ to this earth to establish the Kingdom of God. Prior to the beginning of the seventh seal, God is going to seal a group of 144,000 people, representing the 12 tribes of Israel, and a great multitude (Revelation 7:3-4, 9). The Greek word sphragizo, translated “sealed,” has the meaning of stamping or marking for security. This same word is used by Paul in Ephesians 1:13 to describe Christians who were “sealed with that holy Spirit of promise” and in Ephesians 4:30 to describe Christians who were “sealed for the day of redemption.” God’s faithful people are thus going to be protected from the punishments soon to come upon the rest of mankind, people who are in rebellion against God. As the seventh seal begins, seven trumpets, representing a series of punishments, prepare to sound (Revelation 8:6). By the time of the fifth trumpet, the punishment will be so severe that “men will seek death and will not find it; they will desire to die, and death will flee from them” (Revelation 9:6). During the sixth trumpet, a third of mankind will be killed (verse 18). The mercy of God soon follows when the seventh trumpet sounds to announce that “the kingdoms of this world have become the kingdoms of our Lord and of His Christ” (Revelation 11:15). Although there will still be “seven last plagues,” also called “bowls full of the wrath of God,” until “the wrath of God is complete” (Revelation15:1 and 7), events on earth are now destined to improve. When Christ returns as King of Kings and Lord of Lords, the Kingdom of God will be established and 1,000 years of peace and prosperity will begin.